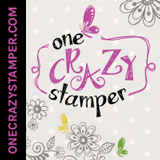 Lora's Crazystamper Blog: Look at Nana go!!!! I really enjoy colouring the Senior-ita girls from Stamping Bella and I just love Dolores. My husband is always saying he is going to get me one of these little machines, BUT he is afraid I might kill myself since I have no co-ordination skills. I'm bad enough on 4 wheels never mind just 2 LOL! I can totally see this as me in a few years though. I coloured Dolores with my new Spectrum Noir pencils. I must say I really like these pencils, I give you fair warning they are addictive! They go on smooth, blend very well with Gamsol & blending stumps. The colours are vibrant without being too much. Yes I know I took yet another break from my Copic's...who would have thought. I used Your Next Stamp Gumdrops ontop of the ribbon. Now this is one application for these little beauties that I thought for certain I would need to use liquid glue with. I put them in place & went to take them back off to put the glue on and guess what...they stayed right where I put them....NO glue! I seriously love these things! I also used the Ecstacy Crafts Spring Folder Fun embossing folder "Roses" for the background on this card. Hope you enjoy today's post, see you again soon & thanks for stopping by! Love the card Lora. Looks like Dolores is on a mission. What fun. You did an amazing job as usual. Just love the colours you used. Something else to play with.